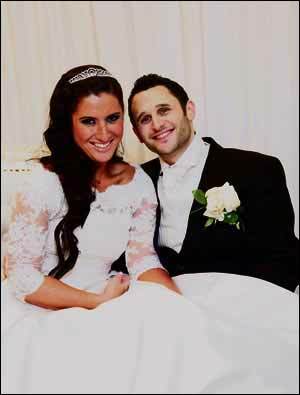 Tammy Kopelowitz and Steven Durban, who met through a mutual friend, were married at the Last Drop Village in Bolton by Rabbi Naftali Schiff, of Aish. Tammy, a transport architect, is the daughter of Michelle and Allan Kopelowitz, of Johannesburg, South Africa, while IT consultant Steven is the son of Marian and Vic Durban of Whitefield. Joining them in their celebrations were family and friends from South Africa, America, Canada, Israel and Denmark. The newlyweds honeymooned in Thailand and Hong Kong and have settled in north Manchester. Best men were Daniel Gordon and Anthony Horwich. Bridesmaids were Andy Kopelowitz, Lee Kaplan, Hannah Colam, Abby and Rafi Robbins, Noa Bloom, Kyra Aires and Tzivia Silverstone. Pageboys were Oliver Colam and Brayden Aires.